This is a demonstration of our program recognizing a red, blue and yellow piece of paper. The green circles in the video show where the program has detected objects of the right color. We have taken the robot apart such that we could work on the robotic arm and the IRobot separately. Today we have put them back together and this is the result. 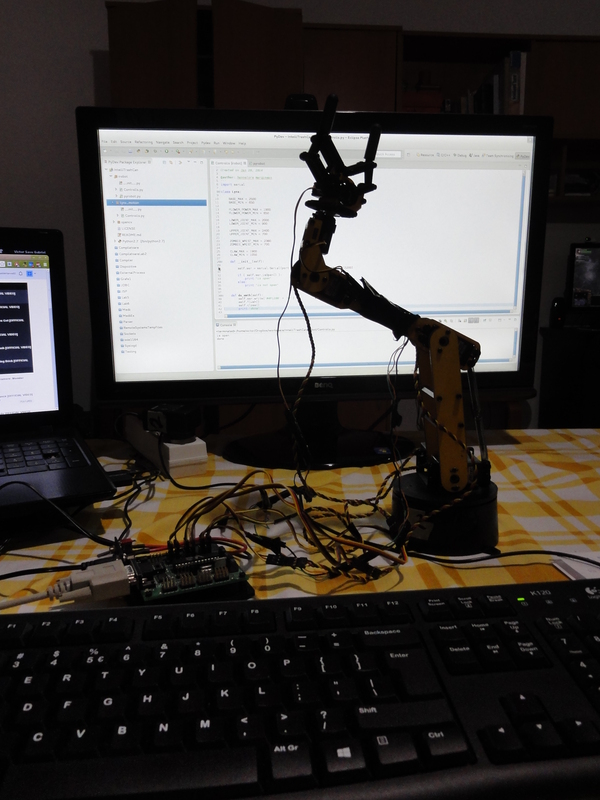 Smooth motion for moving the arm in a certain amount of time is finished. This is a preview on how it works. This has been my view for the last two days and I can say that progress is being made :). This robot can be built a lot easier! After thoughtful reconsiderations and some tips from our professor we came to the conclusion that the robot can be built much easier if we use a robotic arm instead of building the structure using a broom and a dustpan. So we took off our metallic structure from our iRobot and then we placed the robotic arm on the new structure.